Mid July I gave a mini-clinic to Valentian and a friend of hers who are both 13 years old. Both of them wanted to learn a little bit more about riding and horses and their mums also were looking for a method where the rider and the horse interact and exchange and learn also from each other. Valentina is Dutch and so far she has done a couple of camps but was not satisfied with what she learnt. She is light as a feather and needs a lot of achoring. So the first day I put both of them on the lunge line with voltige surcingle to asses their balance and seat. The second day we did liberty and ground work and they learnt the use of it in our day day to day routine. Valentina was impressed when she saw that only by achoring and using her finger that she could move a 500 kg horse backwards. The last day I made them ride again on the lunge but this time with the saddle. Her friend had the chance to lunge Valentina while she was only concentrating on her seat. The first day Marie-Yasemin was there also and took some pictures. We didn’t put side reins because Shah is sensitive with her hocks and more comfortable in that way. 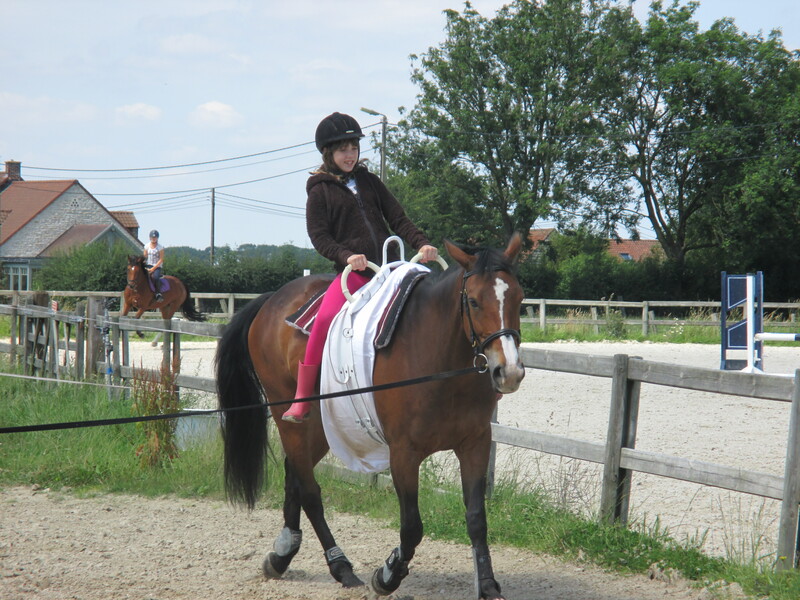 Vantina loved Shah and will continue to ride her all year long.